Bacteria and viruses thrive in warm, moist environments. But they can live a surprisingly long time almost anywhere you touch: countertops, door handles, curtains, toys, computers, even inside refrigerators and freezers. In fact, scientists just discovered long-dormant germs in animal remains exposed by melting permafrost in Siberia. A 12-year-old boy died and 20 people were hospitalized before doctors realized they’d been exposed to infectious anthrax, which endured 75 years of sub-zero temperatures. Bacteria and viruses are tough survivors, composed of many different types that can adapt to a wide variety of environments. To the human eye, a living room wall might not look very dirty. But it can be full of microscopic germs that cling to the surface. In general, infectious viruses prefer the human body first, followed by hard surfaces at room temperature. The smallpox virus, for example, can easily live for months – even years – on a tabletop. That’s why it caused a devastating epidemic before the smallpox vaccine. Some viruses survive for shorter periods outside the body, although “shorter” is often still long enough to infect other people. Hepatitis B and C can live between 16 hours and 1 week. Cold viruses can survive 1 week and flu viruses die after about 24 hours. HIV is an example of a virus that dies almost instantly outside the body. There are also viruses that are less deadly but widespread, like stomach flu bugs. Norovirus, also called viral gastroenteritis, is a common cause of diarrhea and vomiting in children. It can live for days or weeks outside the body, depending on the surface and environment. 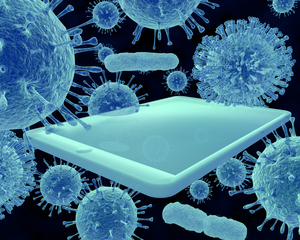 While viruses like hard surfaces, bacteria prefer porous surfaces like fabrics and food. They cling to the tiny grooves in the material and sometimes even create spores to expand their colonies. Salmonella and Campylobacter, which can cause severe diarrhea and vomiting, can live about 1 to 4 hours outside the body. Staphylococcus aureus, the bacterium that causes dangerous MRSA infections, can live for many weeks because it thrives without moisture. These are of particular concern at hospitals and food service establishments. Two strains of strep that cause ear and throat infections, S. pneumoniae and S. pyogenes, were recently found to survive more than 24 hours on soft things like stuffed animals. That’s much longer than previously thought, and significant because many public places— including daycare centers and schools— based their cleaning procedures on the idea that those bacteria couldn’t survive overnight. It’s easy to forget that viruses and bacteria sit on objects all around us. Some places seem dirtier than others, but looks can be deceiving. Sure, public restrooms might be full of infectious germs … But what about the things closest to you, all day long? Here are a few examples of surprisingly germy things. Hands: Your hands are the dirtiest part of your body and the primary exposure point for bacteria and viruses. The average person touches their face with their hands at least 16 times per day, bringing germs into their ears, eyes, nose, and mouth. Cell phones: Because cell phones touch the hands and face, they are also major germ carriers. This is especially true during flu season because influenza can survive on a cell phone for 2 to 8 hours. MRSA has been found on cell phones 8 to 9 days after exposure. Keyboards: One study found that personal keyboards had three times more bacteria than a public toilet seat, with 3,000 bacteria per square inch. Money: A 2017 study of $1 bills at a New York bank found hundreds of species of microorganisms, including enough E. coli and salmonella to easily make people sick. Money spreads germs to purses and wallets, where a warm environment may allow them to live longer than expected. Kitchens: The surfaces in your kitchen hold 5 of the top 10 dirtiest surfaces most people encounter every day: drains, sponges, sinks, faucets, and the floor in front of the sink. All of these spots have more bacteria than either trash cans or toilet seats. Workspaces: A study of 5,000 office spaces found the 6 dirtiest spots with a high risk of spreading disease: break room sink handles, microwave door handles, office keyboards, refrigerator door handles, water fountain buttons, and vending machine buttons. They posed the most risk because they weren’t part of a regular cleaning schedule. Consistent hand-washing with soap and warm water is the best way to keep germs at bay. Keep surfaces clean, especially in the kitchen and bathroom, and discard sponges frequently. Proper food-handling procedures are also crucial to prevent people from ingesting harmful organisms. Be proactive about keeping outside bacteria and viruses from settling into your home and workspace. Of course, some buildup is inevitable, so it’s a good idea to have a routine cleaning schedule to remove harmful invaders and freshen things up. ServiceMaster is a cleaning company that understands the threats posed by bacteria and viruses. That’s why 700,000 customers around the world trust ServiceMaster to clean their carpets, windows, furniture, bathrooms, and all the other spaces where germs can settle in. Contact ServiceMaster now for a free cleaning quote.